'La Remise a Megan' is a charming traditional ski/summer self catering rental chalet with wooden deck, garden and covered parking. It is tastefully decorated, all wooden interior and extremely well equipped with all home comforts. One double bedroom and one triple. It is situated in a quiet hamlet 1km from the centre of the unspoilt ski and summer resort of Les Contamines-Montjoie which nestles just below the Mont Blanc. Les Contamines is renowned for its exceptional snow cover between December and late April and uncrowded, well groomed runs to suit all levels and accessible off piste. In summer there are a multitude of sports, activities, entertainment and places to visit nearby. It is particularly well known for its fabulous walking (it is on the famous 'tour of mont blanc' and stunning views. Les Contamines remains one of the few inexpensive, unspoilt ski resorts of the French Alps. The owners, Sarah (English) and Bruno (French) are knowledgeable locals who are on hand to help make your stay a memorable one. The three chalets are virtually identical and each has 2 bedrooms on the first floor and sleep 5. One bedroom with double bed (160cm) and one triple (3 single beds). On the ground floor is the open plan living/dining/kitchen area and the bathroom and toilet. Each chalet has a south facing sheltered wooden deck with picnic table and deck chairs. A barbecue is at your disposal in summer. The chalets have gardens with childrens swings etc. La Remise a Megane and Les Fraises Sauvages have covered off road car parking. Le Bothy has off road parking. The owners Sarah and Bruno are knowledgeable locals who live close by and are on hand before and during your stay to help in any way to organise your holiday eg in winter to help you book your ski lessons (we recommend Bruno, ESF instructor, for private ski lessons) , lift passes, equipment hire and be on hand for all local advice. A raclette or pierrade machine are at your disposal if you fancy trying these local specialities at home. Summer activities: Les Contamines is on the famous 'tour of Mont Blanc' walking route and is a fantastic base for an active holiday with a multitude of walking routes as well as mounaineering, climbing, mountain biking, tennis, swimming. For families there are many entertainments laid on locally, a pretty boating lake and swimming lake with playgrounds, tree top adventure, crazy golf etc. Or if you need a rest you can just sit back and enjoy the splendid views all around us and the good selection of local restaurants in the village or further afield in the hills. Nearby cable cars and tramways allow easy access to high mountain scenery. We are knowledgable locals (Sarah has lived in Les Contamines for nearly 30 years and Bruno all his life) with 2 girls who love sharing our local knowledge with our guests. We are proud of our three little chalets (built by Bruno) and are on hand to help and advise if required during your stay. Bruno is a ski instructor and should he already be booked up we can recommend other instructors and make bookings for you. The chalets are charming, cosy and well equipped. They are located in a quiet residential hamlet 1km from the village centre and we live just along the road and are on hand to help you make the most of your holiday. The chalets have lovely mountain views and sheltered south facing wooden decks from which to enjoy the views. 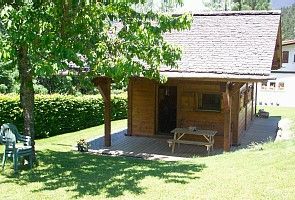 The chalet has one well equipped bathroom on the ground floor and one toilet (separate in La Remise a Megane and Les Fraises Sauvages, in the bathroom for Le Bothy). Bath towels, bath mat and hair dryer supplied. Car shelter shared by "Les Fraises Sauvages" and "La Remise a Megane". Under cover space for 2 cars plus extra outdoor parking spaces. Bath and hand towels and bath mat provided. Please bring your own swimming towels. 4 electric rings in Les Fraises Sauvages and La Remise a Megane. 1 electric and 3 gas rings in Le Bothy. "La Remise a Megane" and "Les Fraises Sauvages" share a garden (with childrens swings). Le Bothy has a very child friendly garden with swings, play house, tree house and ping pong table. The chalet is equipped with child stair gate at the top of the stairs. On demand we can supply travel cot, high chair, children's/babies toys and 3 wheeler pushchair free of charge. Bed linen and towels (and bath mats, t-towels, table cloth etc) are supplied free of charge and beds made up for your arrival. The gardens are child friendly. Whilst we love dogs we will only accept dogs in our chalet if you can assure us of their good behaviour (and pay a damage/cleaning deposit). If this is the case your dog is welcome and we are happy to help make the necessary vets appointment etc for your return to the UK. Nous avons passé un très bon séjour dans deux des chalets de Sarah et Bruno... et le chalet cabane a fait la joie de notre petit garçon! Une très bonne adresse, c'est tout! Des vacances superbes, chalet agréable et typique. We had a wonderful 3 weeks skiing and thoroughly enjoyed staying at Les Fraises Sauvage. The chalet is warm and cozy, well maintained and met all our needs. Sarah and Bruno were very friendly and helpful and did everything to make our stay memorable. We'll be back! High quality chalets with everything that we needed for our stay. Owners so helpful. Wonderful walking all around. We stayed 4 weeks and will return next year for a longer stay! Les Contamines-Montjoie is situated at the foot of the Mont Blanc at the end of a picturesque valley. Access is easy by car being only 15 mins from the motorway and just over 1 hrs drive from Geneva airport. Les Contamines-Montjoie is in the Haute Savoie region of the Alps, close to St Gervais, Megeve and Chamonix. It is on the famous summer 'tour of mont blanc' hike and close to the Italian and Swiss borders making it a perfect touring base. From Christmas to late April Les Contamines is a skiers paradise with 120kms of well groomed runs and plenty of safe, accessible off piste. It is suitable for all levels of skier. It remains unspoilt, traditional in style and inexpensive. On the ski slopes there are plenty of cosy little mountain restaurants. There is excellent cross country skiing on the valley floor and an ce skating rink in the village centre and a good selection of cafés/restaurants/bars in the village. Easy access to Chamonix (25 mins) and Megeve/St Gervais (10 mins) by car. Les Contamines is one of the most snow sure resorts in the French Alps. There are plenty of English speaking ski instructors for either group or private lessons and we can make bookings for you. Other winter Activities: Cross country skiing, snow boarding, sledging, husky dog sledding, snow shoeing, walking. In summer Les Contamines is a hikers paradise with an unlimited number of day hikes or longer hikes with overnight stays in mountain refuges. Hikes to suit everyone from young families (you can cheat a little by using the local cable cars) to the extremely fit. There are many sports on offer locally: swimming lake, indoor and outdoor swimming pool, tennis, mountain biking, golf practice range (and great courses within 30 mins drive), archery, slack-lining, rock climbing, mountaineering and much more.